Until now, WhatsApp admins can add anybody to their WhatsApp group without the person's consent, as long as the number is in their contact list. Even though users can leave the group at anytime, it's still very annoying finding yourself in a random group without your consent. WhatsApp is however tacklig this privacy issue with its latest update. A new update is now being rolled out which will give WhatsApp users control over who can add them to any WhatsApp group. The new update comes with 3 options which are "Everyone", "My Contacts" and "Nobody". 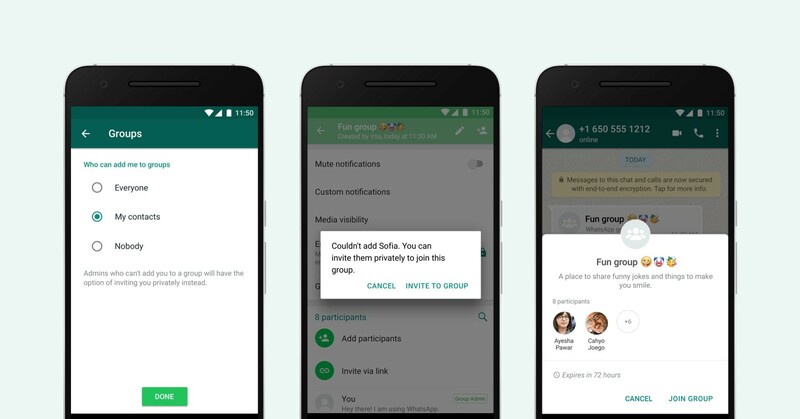 If you set the Group's menu option to "Everyone" which is the default, then everyone will be able to add you to a group, it you select "My contacts" then only those in your contact list will be able to add you and if you select "Nobody", then everyone who wants to add you to a WhatsApp group will need your consent. If you are a group admin and you want to add anyone with a restricted access, you will be required to send an invite link to the person via private message and the user will have 72 hours to accept the invite after which the link wont be active anymore. To access this new feature, just head over to Settings > Account > Privacy > Groups. The new feature has already started rolling and it's expected to get to all users soon.